Cub Scouting is Fun,Adventure & Excitement! For more information on 704, please visit the "About Us" page. 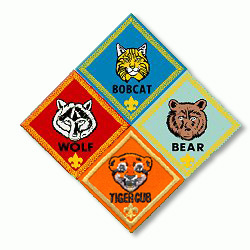 For security reasons a BSA application must be submitted, approved, processed, and pack dues must be paid in full before your www.pack704.org website account will be approved. This years fundraiser is offically over. Thanks to all of you who supported us! Youth Protection Training - Takes 15 minutes online at the link below. Go to this link: www.myscouting.org. You will need to create an account by clicking on the create account button and following the directions. Be sure to print and save the copy of your certification, if you we not have a copy of this certificate I cannot submit your adult application. Cub Scout Pack 704 would like to welcome all of our new scouts and their families. We look forward to getting to know you all, and to having lots of fun together. Please do not hesitate to contact us with any questions.